Light things up with (from left to right): the Life of the Party, the Veteran, and the String Theorist. For you hard-core DIY types (and you know who you are), we’ve come up with a few starter ideas, confident that you’ll take this concept and run with it. For those of us who aren’t quite at the rewiring-a-lamp-ourselves stage? 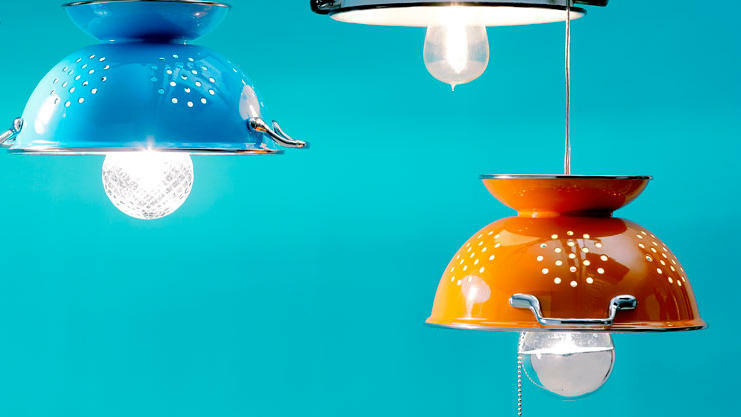 Buy a hanging lamp kit, drill a hole through the colander—just don’t use an everyday plastic one—and merge the two. And if changing a lightbulb pushes the envelope of your technical capabilities, never fear: The website Posh Living sells a kitchen colander pendant lamp ($150; poshliving.com) that’s ready to be installed by your friendly neighborhood handyperson. The Life of the Party. Go disco with bright colors and a cut-glass globe (Calypso Basics 3-qt. colander; 45-watt crystal-cut halogen bulb, $6.95, buylighting.com). The Veteran. Mix a flea-market colander with an old-fashioned “squirrel cage” bulb (vintage colander; 30-watt tungsten-filament reproduction, $13, houseofantiquehardware.com). The String Theorist. Install a pull-cord lamp holder and add a silver-dipped globe (Calypso Basics 3-qt. colander; 60-watt Satco silver-bowl incandescent, from $2.14, 1000bulbs.com). The Sweetheart. Mount a globe light inside a melamine colander for a soft glow (Tovolo colander, $12, amazon.com; Westinghouse globe fixture, $7.98, homedepot.com). The Workhorse. In high-traffic locations, install a cage around your bulb (Calypso Basics 3-qt. colander, $20, restonlloyd.com; Cooper Wiring bulb cage, $8.95, centerhardware.com). The Space Alien. Pair a deep, stainless-steel colander with a cylindrical ceiling fixture for that Sputnik look (Norpro Krona 4-qt. colander, $42, norpro.com; Westinghouse 66919 fixture, $8.10, build.com).